Bayeux’s origins go back to the Gallo-Roman period. In 924, it was incorporated into the lands of Rollo, Viking warrior and first Duke of Normandy. At that time, Bayeux was the second largest city in Normandy after Rouen. The Romanesque cathedral was completed during the reign of William the Conqueror. It was built in less than fifty years, and for several centuries it housed the famous Bayeux Tapestry, commissioned by Odon de Conteville, Bishop of Bayeux and half-brother of William. In 1204, when Normandy became part of the Kingdom of France, it was a prosperous city, dominated by the church. In the 18th century the town began to modernise and the castle and walls were dismantled. Craftsmen and shopkeepers rubbed shoulders with the nobles and gentry who built many beautiful mansions and town houses, which can still be seen along the cobbled streets. The Notre Dame Cathedral of Bayeux, a masterpiece of Norman Romanesque and Gothic architecture, is at the heart of the old town’s conservation area. Its history is as grand as the two towers which flank its facade. The cathedral was consecrated on 14 July 1077, in the presence of William the Conqueror, Duke of Normandy and King of England, and his wife Matilda. All that survives from the construction of this period is the crypt, the towers at the western end and the first level of the nave. It is part of a wonderfully well-preserved Episcopal complex. Guided tours include visits to the chapter house and treasure room, which are otherwise closed to the public. More information from the tourist office. "Follow the studs!" A self-guided walking tour of 2.5km (approx 1 ½ miles) takes you around the medieval town. 23 information panels are dotted along the way and dedicated markings on the ground, made of bronze nails, help you find your way. The river passing through Bayeux is called the Aure. 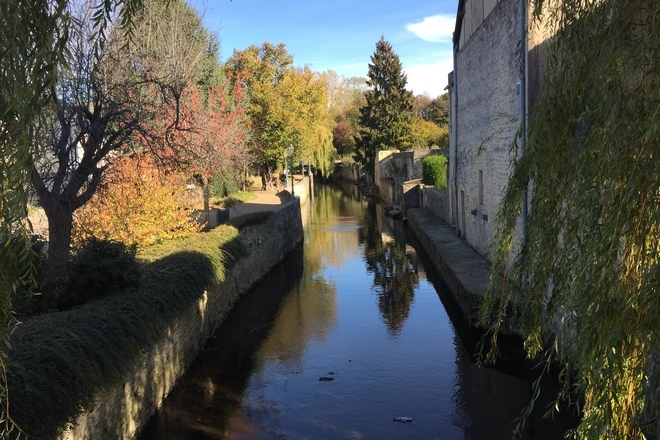 Once a neighbourhood occupied by tanners and dyers, the banks of the river Aure are now beautifully landscaped and provide pleasant spots to enjoy nature in the heart of the town, with unexpected views of the town’s heritage and architectural gems. The 4km (2 ½ mile) footpath, punctuated by benches and children’s games, also leads visitors to the heart of the Sensitive Natural Site of the Aure valley.